It is quite possible to make solid attempts at mimicking wild bird feeding tendencies with our companion parrots. In doing so, we must first recognize that what is sought is not so much a "wild" diet, but a "natural" diet. Feeding a natural diet means that every effort is made to eliminate severely processed foods from the food bowl; not all such items of course since proper nourishment is the ultimate goal with any parrot, but those processed substances that can be replaced in the nutritional regime with raw, natural foods. We all may not be able to duplicate wild bird diets for our charges as much as we like, but in the end a green bud is a green bud, a watermelon, cantaloupe, or squash seed is still a delectable seed, and a coconut morsel is akin to a tender palm nut center. By learning to see the "edible" world through the eyes of a parrot, food choices for your flock will expand immeasurably. 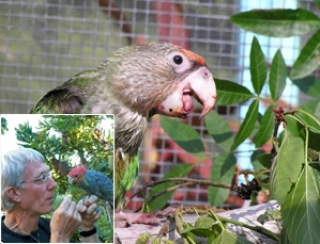 EB Cravens joins us in this podcast to discuss what he has learned over the years regarding the benefits of offering our companion parrots a nutritionally diverse selection of natural and wild foods as part of their daily diet.